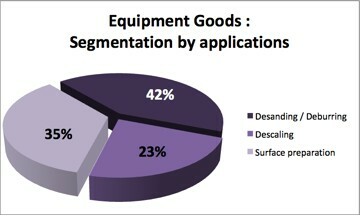 Equipment goods represent 14% of the worldwide abrasives market. Steel abrasives play a key role in the production of many industrial components. Blasting has to remove surface defects, create no deformation, provide cleanliness and roughness… with high productivity. With the creation of dedicated products, equipment and services, W Abrasives offers solutions for each segment of the equipment goods market. For instance, the use of our Stelux stainless steel abrasives offers an ecological alternative to other surface treatment solutions, such as blasting with garnet or aluminium oxide, or chemical operations such as acid pickling.